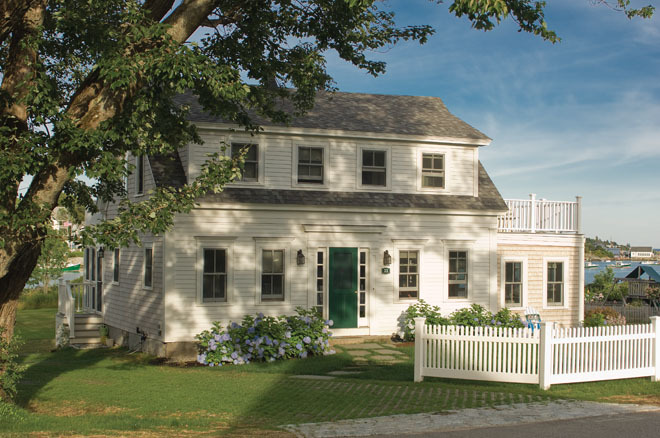 A historic home gets a new life in Cape Porpoise. 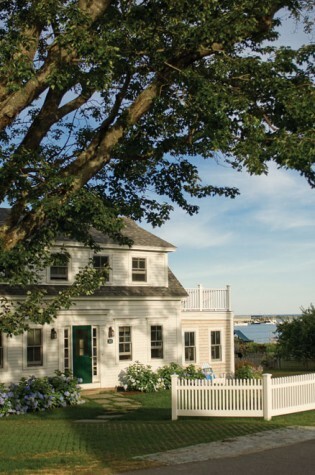 As soon as Marjie Dennis and her husband, Bob, bought this house, they knew they wanted a white picket fence out front. The one they installed mimics the railings on the multiple decks at the side and back of the house. 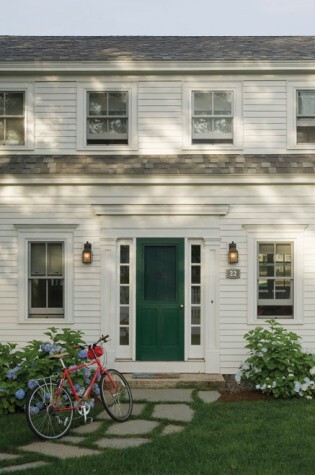 Despite a substantial renovation, the exterior of the house is close to what the original must have looked like. 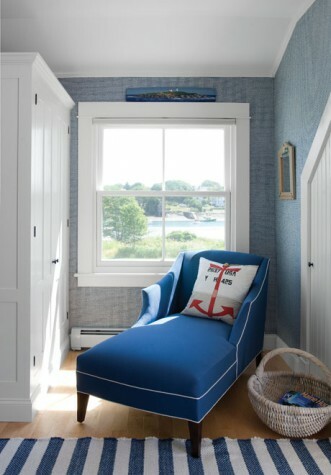 The deck off Bob and Marjie Dennis’s bedroom has a table and two big wooden chairs with striped fabric, the colors of which inspired the design choices for the master bedroom. 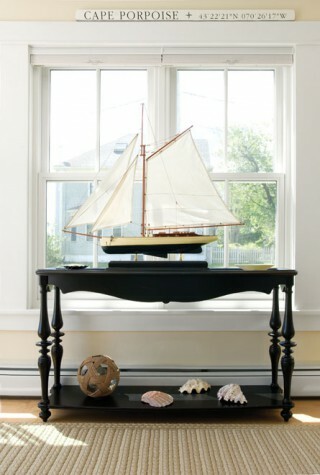 The outdoor furniture is from Anchor Fence in Kennebunk. 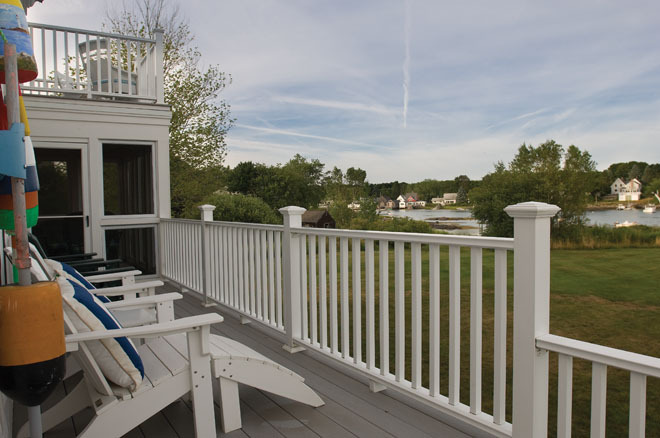 The deck views extend out to Goat Island Light, which is at the entrance to Cape Porpoise Harbor. 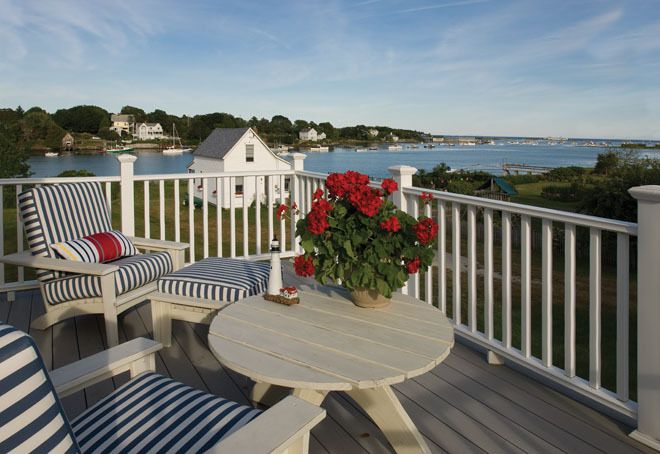 A sweeping view of Cape Porpoise harbor, as seen from the Dennis home. The structure on the left is the fish house that originally came with the property. One of Marjie and Bob Dennis’s daughters is an interior designer. She picked out this bedroom set at Jordan’s Furniture in Massachusetts. 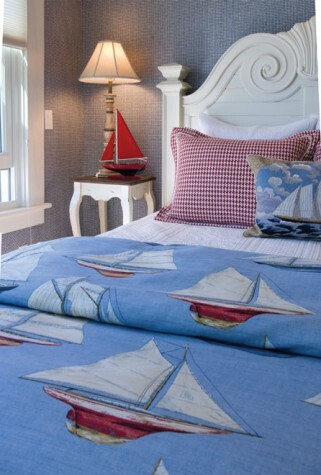 Hurlbutt Designs provided the bed linen and pillows. 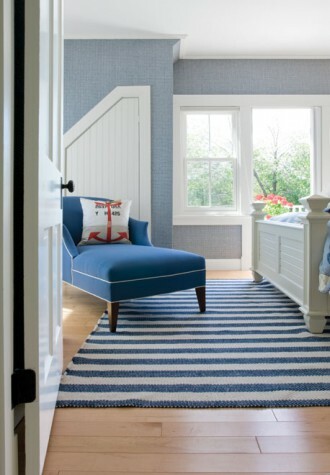 A corner of the master bedroom has a Mitchell Gold and Bob Williams chaise and a Barrier Island wool rug that the homeowners purchased through Hurlbutt Designs. 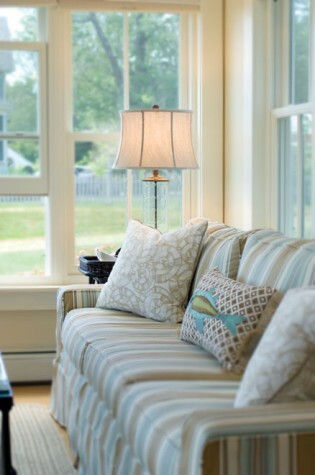 Bree Clark of Wright Interiors in Kennebunkport picked taupe and sea foam green for the ground-floor sunroom. 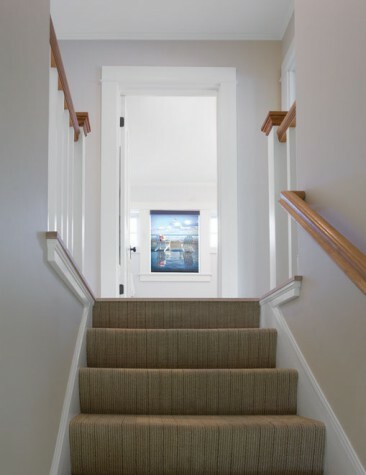 The stairs at the right lead to the living room, which has the same colors with orange accents. 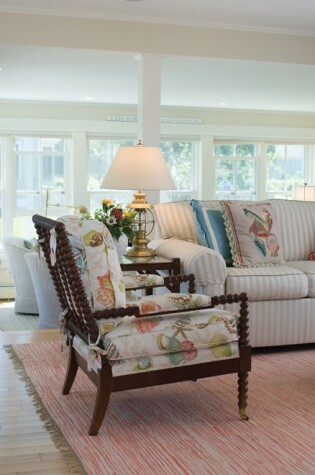 Although the abundance of windows limits the available wall space, Bob Dennis’s photographs hang in spots throughout the home, such as the photograph to the right of the sunroom couch. 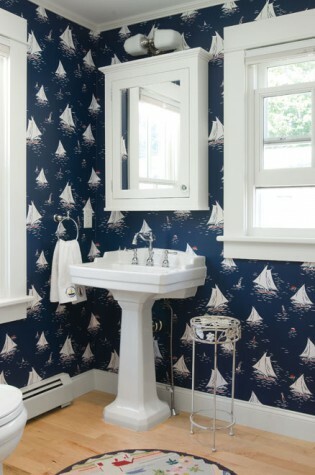 The downstairs powder room with sailboat wallpaper from Ralph Lauren. 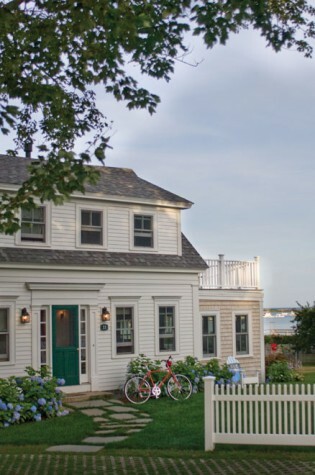 Cape Porpoise resident Ed Sullivan wasn’t thinking of taking on a project when he learned that the house across the street from his was for sale. He wasn’t interested in the house exactly, but he did long for what came with it: a bayside fish house and a spectacular view of the harbor. Wills then took Sullivan through the main house. She told stories of what it had been like to grow up there with her lobsterman father, five brothers, and one sister. (Her mother died of pneumonia when she was just five.) Wills remembered her father trading lobster and fish for milk from the milkman and for vegetables from Cape Elizabeth farms. She showed Sullivan a paw print in the cement of the basement floor, a memento of her father’s beloved springer spaniel. 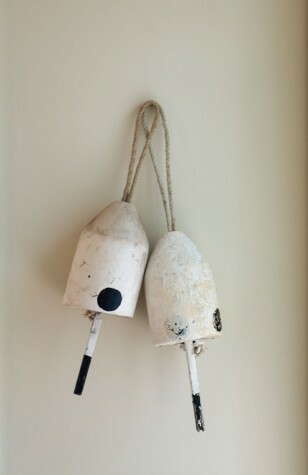 When her father didn’t take the dog fishing, Wills says, the dog “would go upstairs and tear up the bedclothes.” The stories gave Sullivan a different feeling about the old house. He felt its spirit. 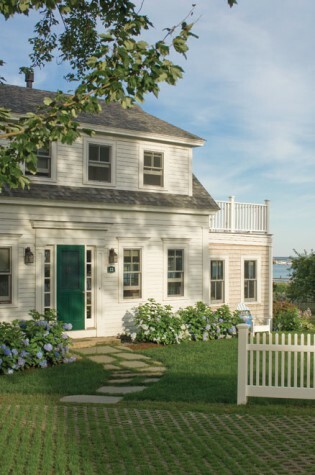 Backman and Sullivan had demolished a house to build their own Cape Porpoise home, and they didn’t want to be known in the neighborhood as the people who tore things down. 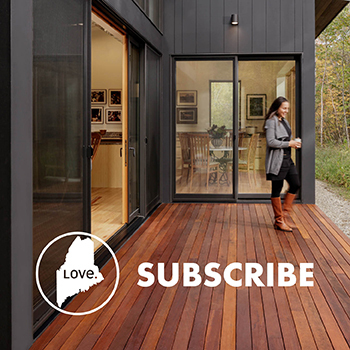 Instead, they asked architect Kristi Kenney, now with Salmon Falls Architecture in Biddeford, to design something in keeping with the modestly sized New England homes on their street. Backman and Sullivan hoped to reorient rooms to the harbor side of the house, where the stupendous views were. Instead of small compartments they wanted an open plan for the ground floor and fewer, but bigger, bedrooms upstairs. 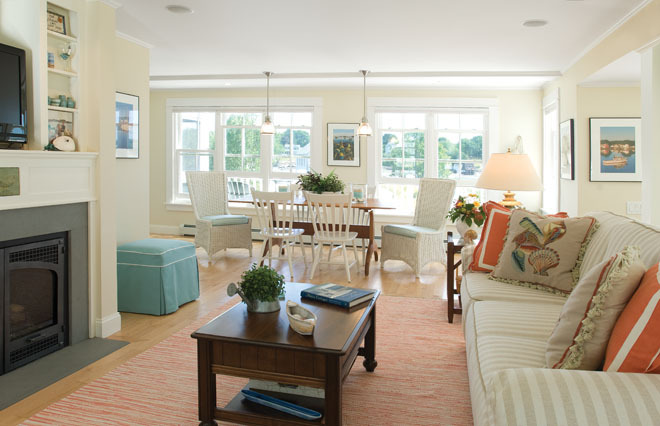 Kenney and Bob Brown of Seacoast Concepts Custom Homes in Berwick helped them conceive of and execute the changes while preserving the lines and scale of the home. The focus: windows (and lots of them) and multiple decks and porches. No house could compete with the views, so why not just design a house that opened itself up to them? Meanwhile, the fish house needed work, too. Brown reroofed and replaced windows, shingles, and some boards. “I had to work with the tide,” Brown says. “The tide comes in and encompasses the building. On a full moon, you can’t get around the building without having to walk in water.” Riverside and Pickering Marine Contractors in Eliot attended to repairs of the dock. Initially, Backman and Sullivan thought they would keep the renovated house and rent it out. But when they learned that they could acquire the fish house and water access and still sell the house, that’s what they chose to do. Enter Bob and Marjie Dennis. The Massachusetts couple—he a retired investment manager, she a project manager at University of Massachusetts–Lowell—had had a second home on Kennebunk Beach for a long time, but they were looking to move. When they saw the renovated home, they knew instantly that it was for them. “There were so many things I loved about it,” says Marjie. 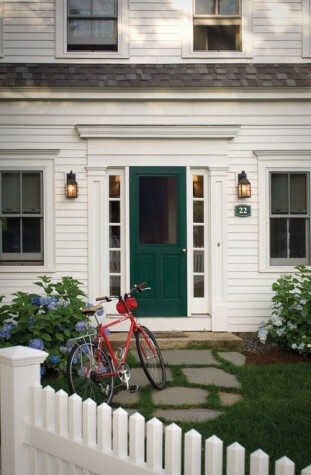 “I loved the kitchen, the gas fireplace, the screened-in porch. And the view! Every room has a view of something. The lighthouse. The fish house. The harbor.” Bob, who is an avid photographer, was attracted to Cape Porpoise for his work. Indeed, the fish house was already one of his favorite subjects. 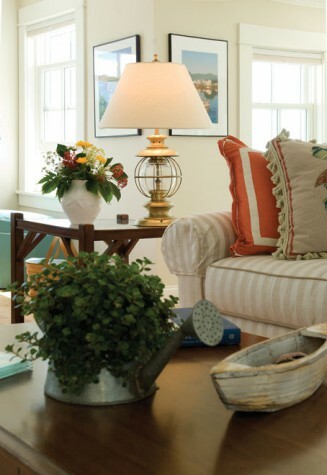 The abundance of windows leaves little room for artwork, but Bob’s scenic photos decorate the downstairs walls and have even been made into colorful window shades that are hung upstairs. Some of Bob’s photographs are taken from the other side of the harbor, looking back at what is now his property. “We never thought we would be fortunate enough to own the house,” he says.